This morning the strains of a flute or recorder drifted up from somewhere outside, and tugged my sleeve, so I wandered down to investigate. I followed the occasional phrases, interrupted now and then with restarts, or shifts to other snatches of melody. A voice joined in singing along from time to time. 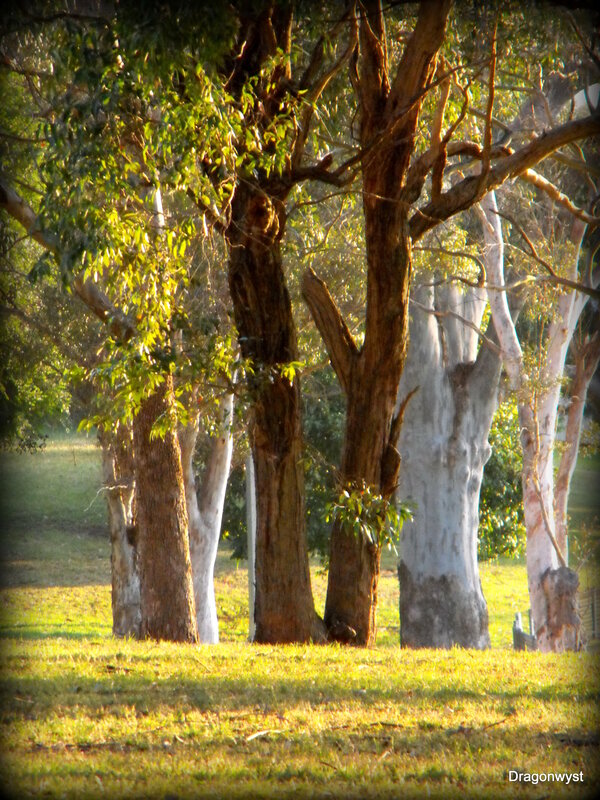 Under the eucalypts on the far side of the park, a man stood, flute in hand. A woman, most likely his wife and also the singer, was picking dandelions or roots of some sort– something the rest of us disregarded, but she recognised as good and useful. I passed them and found myself a place in the sun, leaning against a smooth tree trunk, and let his beautiful notes weave around me. And that was it: a space framed by music, in which so much peace and beauty dwelt. The sun warmed away the winter chill from a sky adorned with a few high, fair-weather clouds. A gentle breeze stirred the eucalyptus leaves and twirled around the children playing on the playground equipment, mingling with their laughter. Down on the oval a father sprinted with his daughter and other children kicked balls or ran races, some serious, some pounding turf for the joy of it. Parents took dogs and children for walks nearby, and further away someone else threw a ball for an exuberant mutt. Noisy Miners tumbled and squabbled, landing momentarily right in front of a surprised toddler sitting on the running tracks, and then flying off again. The flautist continued playing after his wife had gone, met by a little girl running from the playground equipment. Is this not the peace and tranquillity we all long for? What a gift this man gave us, yet I alone stopped to listen, to enter into the weaving of the dream. I could not give him anything else in return, just my listening. Eventually I wandered over to thank him and he greeted me with a beaming smile and hearty “hello”. “China,” he said, proudly showing me his flute – bamboo – which explained the woodiness of its tone, and why I hadn’t been able to distinguish whether I was hearing a flute or recorder at first. He had no English but tried to tell me about the instrument anyway, clearly delighted by my interest. I thanked him again, although I couldn’t explain that I was thanking him not just for the music, but for the weaving of a vision of paradise across the road from my front door. ~ by Dragonwyst on July 12, 2013.